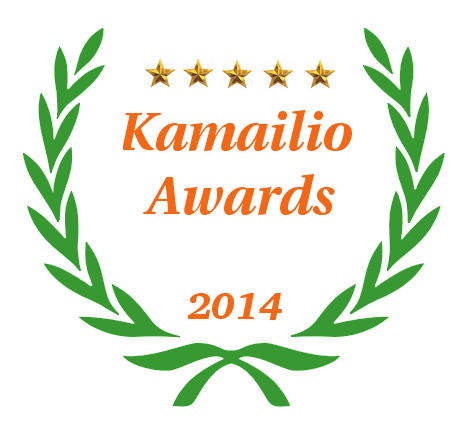 Here we are, the 8th edition of Kamailio Awards granted for the activity during the previous year, respectively 2014. Continuing the tradition, there are two winners for each category. The Kamailio project continued to grow in number of contributions and add plenty of new features. The second edition of Kamailio World Conference and the major release of version 4.2.0 are among highlights of 2014. Toky.co - a venture from Carlos Ruiz Diaz with support by Wayra, Telefónica's startup accelerator, Toky is leveraging WebRTC technology for offering communication services without the hassle of installing applications. Kamailio with its websocket module is used for routing signaling between WebRTC endpoints. KazooCon - the Kazoo project has a fast growing community, fuelling it with an event orgaized by 2600hz.com at the heart of IT industry: San Francisco - Silicon Valley. Embedding Kamailio, Kazoo has become a choice for those willing to start with an out of the box telephony system and enhance it with more features offered by Kamailio. Awarded to people not necessarily working directly with Kamailio, but whose activity has a good impact on the project and open source real time communications. Matthew Jordan - he became a respected leader of Asterisk project in very short time, creating a new vibe around the development of the project, in a time of consistent refactoring for Asterisk application. The success to transform a big project to cope better with the new models of communications is demonstrating once again that one can rely on open source for long term business and not be afraid of being stuck with unmaintained or old technologies. Irrelevant to say that he supported always the efforts to make Kamailio-Asterisk integration simpler and clarify the role of the applications in real world deployments. Peter Saint-Andre - he is one of the people that bridged (and still does it) the open source communities and standardisation bodies over a very long period of time. Getting involved in standardisation process is something that open source should do more, because it can ensure that their development model is protected and practical specifications are standardized instead of hypothetical and over complicated concepts. With open source being driven a lot by immediate needs and standardisation bodies caught a lot in bureaucratic and theoretic approaches, Peter's activity is really remarkable. Although mostly involved in XMPP, he has worked a lot on the specifications for SIP-XMPP interworking, welcoming always Kamailio when presenting about this topic. The activity within Kamailio project during 2015 so far is very rich, check the project web site for announcements on what is new and the plans for the future. Looking forward to meeting many of you soon in Berlin, during May 27-29, 2015, at the 3rd edition of Kamailio World Conference & Exhibition. Another very carefully thought out list following another year of growth for Kamailio. I am particularly pleased to see Alex Balashov and Giacomo Vacca recognised for their efforts in spreading the word - both have been extremely active at 'Evangelizing' the Kamailio message globally over the past 12 months. I am very much looking forward to Kamailio World 2015 - clearly the best Real Time Comms event on the calendar in Europe!